If you want you bag to be carried more comfortable then you have to check out this beware of dinosaur handle wrap. 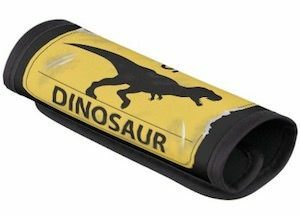 Now you can wrap you suitcase or other bag in this handle wrap making it way more compatible to carry and on the wrap it shows a yellow warning sign with a big dinosaur in the middle and the around it the text “Beware Of Dinosaur”. Now almost any bag will be easy to carry all thanks to this handle wrap that you just fold over and it will be kept in place by velcro and the wrap is made from neoprene to be comfortable on the hands. Some bag or suitcase handles just really hurt when you carry you bags but that can be a thing from the past thanks to this cool handle wrap. 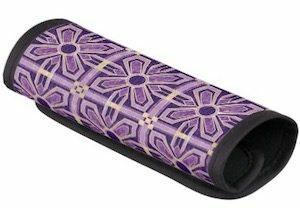 The handle wrap has a purple art deco flower design and it looks really cool and different. The handle wrap is made from neoprene and that makes it soft, strong, and comfortable to hold and the wrap just goes around your current handle and states in place thanks to velcro. So put this wrap on a bag with a bad handle and you can carry it with easy. Besides making carrying your bags better it also makes it great to find you bag because you of the special design of the handle wrap. We all know how uncomfortable some handles of suitcases and bags are but now you can add this comfy handle wrap over it and it will be so much better to carry your bags. 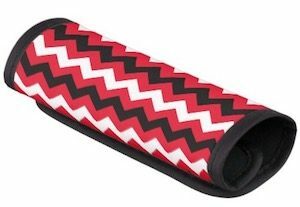 This handles wrap is red with white and black zigzag lines and that makes it easier to spot your bag to because not many people will have that design handle on the same bag you have. 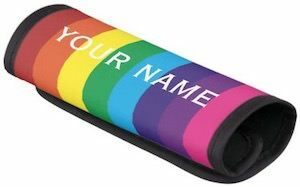 Made from neoprene this handle wrap is soft and comfy and would work on many kinds of bags like suitcases, sports bags, or your school backpack. Often bags and suitcases don’t have a great handle to carry them but that is why they invented handle wraps to make them perfect for carrying. 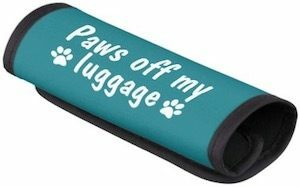 Now there is a fun handle wrap for people that like animal paws as it shows two on there and also the text “Paws Off My Luggage” so that nobody else is going to take your luggage. A fun handle wrap like this is not only great for carrying but also great at making it easy to find you luggage as now the handle will be something no other bag standard comes with. Want a comfortable way to carry your luggage? 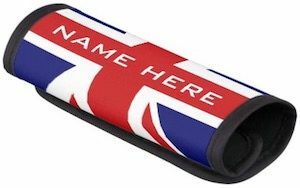 This neoprene handle wrap will help you with that. 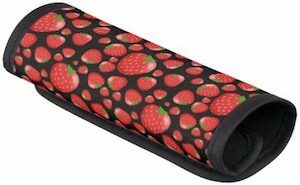 The handle wrap also looks fun as it has a black background with on it many strawberries. Just put this handle wrap on your suitcase, backpack, laptop bag, or sports bag and you will know what your bag is thanks to this fun looking wrap around the handle. Now it becomes easy to carry that bag that always hurt you because the neoprene will make it comfortable and fun. And don’t worry about losing the handle wrap as it is held in place by velcro. Bag handles are not always that great to use but if you have a handle wrap carrying that bag will become a lot easier and they often look way more fun to. This handle wrap is all ready for Easter with a cute little chick that can be found all over it and or course Easter eggs and that all in front of a light yellow background. Just put this on your suitcase or other bag and it will be easier to spot and way more comfortable to carry as it is made from neoprene to prevent those sharp handles from hurting your hands. Some suitcases and bags are just not comfortable when you carry them and for those bags they made this handle wrap witch is made from neoprene and is strong and fun to look at. 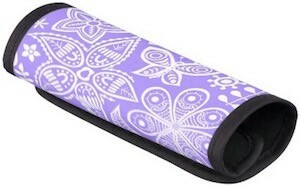 The handle wrap is purple and has in white some groovy looking flower on it and that of course makes you bag look so much better then others just because of this special handle wrap. Also with a handle wrap like this it will be a lot easier to spot your luggage at the luggage carousel at the airport. We all know the feeling of carrying a bag that is heavy and the handle hurts your hands. Stop doing that as it’s not necessary, you can just get a fun handle wrap that makes it soft and comfortable to carry. This handle wrap is covered in colourful sheep in all kinds of fun colors almost like a rainbow of sheep. The sheep handle wrap is made from neoprene and just connects with velcro to our handle and that is is you are ready to carry bags in comfort. And even if you handle is comfortable already this handle wrap makes it looks super fun and it makes you bag more easy to find.